Report Objects give the PHP programmer the ability to embed QLR Manager reports into the body of their web pages. These report objects can be tabular report data, a chart, or both depending upon the layout that was applied. ReportObject.php is a PHP Class file that is used to generate a report object. It provides a number of PHP functions that can be used to build and manipulate a report. Ultimately, a report body and set of Cascading Style Sheet (CSS) entries are returned. The default is for a single report of all records found to be returned in the Report Object. "Report Blocks" can be specified by using the setStartRow() and setBlockSize() functions. Additional functions in this class such as runQuery(), getDataRow(), and others, also provide the Programmer with basic database interface capabilities. Input Controls can be used in conjunction with report objects to collect user input for query variables. These input controls can be created by logging onto the "User ID Admin and Tools" function from the QLR Manager Connect panel and selecting Input Controls. They can also be created on-the-fly by clicking the link in the Query or Wizard panels. The functions getControl() and setControl() are provided to implement the controls in a PHP generated web page. Some controls are returned in a table to preserve formatting. This is the most expedient way of providing an input control to collect user input. However, this may not provide a control that fits well with the web page design. An alternative is for the Author to create their own control and pass the selected value(s) to the report object using the setQueryVar() function. This method provides unlimited flexibility in the design of the input control. Whether using input controls that have been created in QLR Manager or a control designed by the Author of the web page, the method of implementation is the same. • Create a web page that will display the input controls to collect the desired values. This is accomplished be creating an HTML form, which uses <form> </form> tagging. The key element of this form is the ACTION to process when the "Submit" button is clicked. It is the name of the PHP file that will be called to create the report object. Example #5 contains the code for creating an input control web page. • When the "Submit" button is clicked, it will execute a file called custinv.php. custinv.php should contain the PHP code (see examples below) to create a report object. custinv.php can use the customer number that is being passed to it via the HTML <form>. It's value can be accessed via PHP using the $_POST array entry of $_POST['customer']. The customer number can be supplied to a stored QLR Manager query using the setQueryVar() function. See Example #2 for an example of how to set query variables. Report Objects are only available in the Enterprise Edition of QLR Manager. There are several basic steps used to create a report object. It is assumed that these are performed within a PHP environment. 1. A PHP session is started. 2. A session variable called 'inc_path' (or optionally, qlr_inc_path) is defined. This variable identifies where the QLR Manager files are located in relation to the file that is requesting to create a report object. 3. Include the file ReportObject.php in the code. 4. A report object is created using database connection values that have authority to run the query to produce the report. 5. The query and layout used to produce the report are defined. 6. Optionally, values for query variables and changes to the layout can be made. 7. The report is created. 8. The report and CSS values are requested. Steps 4 through 7 are repeated for each report to be embedded into a page. Query execution time: 0.001 seconds. Layout formatting time: 0.008 seconds. The following examples provide more information about how report objects can be customized to meet different needs. Example #1: This first example uses the basic steps to create a report from a stored query, owned by 'frank', named '13. Break level formula'. The necessary statements are highlighted in blue. This example can be executed at http://www.qlrmanager.com/demo_rptobj/example_1.php. Example #2: This second example uses a few additional functions. It shows how to set the values for query variables that may be present in the query, and retrieves the CSS entries separately from the report table data. Also, the row count is requested to determine what to display when the query does not produce any records. This example can be executed at: http://www.qlrmanager.com/demo_rptobj/example_2.php. // If the query allowed, multiple values could be submitted separated by commas: "'Brazil','UK','USA'"
Example #3: This is an example of a page containing more than one report object. For each report, a separate report object is created. Notice how the Cascading Style Sheet (CSS) entries are retrieved separately from the report and included in the HTML Head section. When creating multiple reports that require multiple sets of CSS entries, this method is safer for supporting older browsers. By default, a report object is created pointing to the same database engine where the QLR Manager master tables reside. The comments below describe how $rptObj2 can be defined to run against an SQLite3 database. Valid values for the database engine are 'db2', 'sql server', 'sqlite3', 'mysql', 'oracle', and 'postgresql'. Once the database engine has been set, that is the database engine that will be referenced until changed to a different value. This example can be executed at http://www.qlrmanager.com/demo_rptobj/example_3.php. Example #4: This is an example of creating a Microsoft Excel file for download from a report. When creating a download file, no characters can be sent to the browser prior to executing getOutputFile(). This example can be executed at http://www.qlrmanager.com/demo_rptobj/example_4.php. Example #5: This is an example of creating a page to collect input variables to be passed to a page that will create a report object. This example can be executed at http://www.qlrmanager.com/demo_rptobj/example_5.php. // The following is optional php code that will echo the dates submitted when the Submit button is clicked. // Set the start and end dates based on what the User entered. <iframe id="calWin" name="calWin" src="../demo/qlr_manager/calendar/calendar.html" width="192" height="75"
Example #6: This is an example of using a Report Object to create the contents for a report file. A report is generated and using standard php functions, a file is written. This example can be executed at: http://www.qlrmanager.com/demo_rptobj/example_6.php. echo '<p>The file can be viewed at this URL: <a href="http://www.qlrmanager.com/demo/reports/example_6.html">'. This example can be executed at http://www.qlrmanager.com/demo_rptobj/example_7.php. // If the query allowed, multiple values would be submitted separated by commas: "'northwest','northeast'"
Example #8: When many report objects belonging to the same User ID owner are used in the same page, and recognizing that establishing the database connection for each report or chart affects page load performance, the DB connection can be reused by adding true as the fifth argument passed to defineReport as illustrated in the following example. This example can be executed at http://www.qlrmanager.com/demo_rptobj/example_8.php. Example #9: This is an example of creating a page to use slider input controls. Since sliders are much more complex than form controls that are often used to set query variables, there are some specific requirements for the page to render sliders. This example can be executed at http://www.qlrmanager.com/demo_rptobj/example_9.php. // Notice the class that references the name of the slider with a suffix of "_cel". // This must be used for any container, div, td, etc. to set the margins saved with the slider. This function allows for content to be added as a file attachment to an e-mail. The e-mail is sent using the sendMail() function. Multiple files can be attached by calling this function more than once. // Note: Once sendMail is executed, it resets the current attachments to empty. See sendMail() for information about sending an e-mail. In addition, getFileData() is used to retrieve the current report in a particular file format. This calls the QLR Manager clean up routine. It will delete QLR Manager pages that are over 12 hours old. This is intended for installations that primarily run Report Objects and rarely use the traditional QLR Manager interface. The traditional interface invokes this routine once a day with the first log on through the Connect panel. Creates the report based on the query and layout parameters provided in defineReport(). Returns either "report" when a report table is successfully created or "info" when an informational message is generated instead of a report. Defines the query and layout to be used as the basis for the report. Alternately, if the query_owner is defined as '*query_text*', a query string can be entered as the query_name as illustrated in Example #2. If no layout is desired, the layout_owner and layout_name can be entered as '' (empty single quotes). The queries used in this function should be a single SELECT query, to which a layout can be applied. Note: The query and layout specified in defineReport() must either be owned by the ID that was provided when the new ReportObject() was created, or the query and layout must have been saved to be SHARED with other users. Returns an HTML formatted string for the specified Input Control. If the Input Control is not found, a "not found" message is returned. The HTML "name" is the Input Control name. Some controls are returned in a table to preserve formatting. If the Input Control is a date input with the calendar, there are some CSS Classes, a JS file import and an <iframe> element that must be included in the web page. Please see Calendar input control for more information. Note: This function should be called after setControl() has initialized the input control(s) for use. The Input control owner can also be used when setting and getting a control. This is necessary when the control does not belong to the connection ID used when defining the report object. • [Select all] [Deselect all] [Reverse] for checkbox groups and multi-select lists. • Character limit for text areas. • Selection limit for checkbox groups and multi-select lists. • Regular Expression validations and string replacement for text inputs and text areas. Returns the Cascading Style Sheet (CSS) values needed to format the report table. Note: It does not return the opening and closing <style> tags. Returns an associative array of the values in the current result set and then points to the next record in the result set. Returns the database engine error message when runQuery() returns false. Returns the database engine error number when runQuery() returns false. Returns the field name from a result set associated to a column number. The first column in a result set is equal to zero. This returns the current report data formatted in a particular file format. csv Comma separated value file. csv+ Comma separated value file with report column headers. csvr Comma separated value file produced from the raw query results. This is much faster, but bypasses applying any Layout data modifications. csvr+ Comma separated value file with report column headers produced from the raw query results. This is much faster, but bypasses applying any Layout data modifications. doc Microsoft Word Doc file. html+ HTML formatted file that can be imported into MS Excel or Word. txt Semi-colon separated value file. txt+ Semi-colon separated value file with report column headers. txtr Semi-colon separated value file produced from the raw query results. This is much faster, but bypasses applying any Layout data modifications. txtr+ Semi-colon separated value file with report column headers produced from the raw query results. This is much faster, but bypasses applying any Layout data modifications. xls Microsoft Excel file (data only). xls+ Microsoft Excel file (data only) with report column headers. xlsr Microsoft Excel file (data only) produced from the raw query results. This is much faster, but bypasses applying any Layout data modifications. xlsr+ Microsoft Excel file (data only) with report column headers produced from the raw query results. This is much faster, but bypasses applying any Layout data modifications. xlsf Microsoft Excel file formatted with coloring, etc. xmlr XML formatted file produced from the raw query results. This is much faster, but bypasses applying any Layout data modifications. See addAttachment() for information about adding an attached file to an e-mail. Returns the informational message text generated when createReport() returns "info". Returns both the Cascading Style Sheet values (enclosed in <style> tags) and the report table when createReport() returns "report". Creates an output file for user download as defined by the output type. The file extension is automatically appended to the file name based on the output type. This function is called after createReport(). Note: It is very important that no information is sent to the browser, not even blank characters, prior to calling this function. This function supports the creation of a PDF file stream sent to the browser. Since it does send data back to the browser, no output should be sent from the server prior to this function returning data. The "page_orientation" is determined by examining the first letter of the value provided and is case insensitive. The "paper_size" arguments are also case insensitive. As the "page_width" value is increased, more information can be fit onto a page, similar to how the screen resolution setting works on a computer display. There are two basic ways to provide content to this function. The first is by executing the createReport() function prior to calling getPDFfile and entering '' (empty quotes) as the "page_content" value. The second way is to provide customized content for the entire PDF output stream via the "page_content" value. Following are examples of the two methods. // createReport(). Notice how the last argument for page_content is ''. // The following will create a PDF stream based on the custom content. Returns the query string that was executed by createReport(). This is helpful for debugging, especially when a query includes query variable replacement. Returns the number of rows in the report that is generated after createReport() is executed. Returns the report HTML table generated when createReport() returns "report". Returns the Cascading Style Sheet (CSS) values used to customize sliders used as input controls. Example #9 demonstrates usage. Returns the appropriate style sheet file(s) to support the rendering of the sliders. Returns a date string in the database yyyy-mm-dd format by converting dates that are in a different format for a given Input Control. Returns the report HTML table generated when createReport() returns "report". The CSS entries are created as in-line style="(values)" entries as part of each report table cell. This provides formatted output without having to accommodate CSS entries. The drawback is that it returns more data. Creates an object of type ReportObject and establishes database connection parameters. When using QLR Manager with Oracle, the database name is be entered as '' (empty single quotes). By default, a report object is created pointing to the same database engine where the QLR Manager master tables reside. In this example, the report object specifically points to an SQL Server database. Valid values for the database engine are 'sql server', 'mysql', 'oracle', and 'postgresql'. Once the database engine has been set, that is the database engine that will be referenced until changed to a different value. Returns a string that converts special characters back to their original form in an input control name. When input controls are created as report objects, the name of the input control is used as the HTML form element NAME. The name applied to the input control when saved in QLR Manager may contain invalid characters that cannot be used in the HTML form element NAME attribute. Certain characters must be converted to produce valid HTML. For example, an input control with the name of "first.date(yyyy-mm-dd)" is converted by QLR Manager to "first_pe_date_lp_yyyy_ds_mm_ds_dd_rp". replaceNameChars will convert the QLR use of the form element NAME attribute back to the original input control name. Executes an SQL query string using the connect values as provided when the ReportObject() was created. Saves a file to disk as defined by the output type. The path can be either relative or absolute. The file extension is automatically appended to the file name based on the output type. This function is called after createReport(). Returns TRUE if the file is successfully written. html+ HTML formatted file that can be imported intoMS Excel or Word. This function supports HTML formatted email distribution. It requires that you have a Simple Mail Transfer Protocol (SMTP) server running. This returns true if the email content is successfully sent to the SMTP server, but it does not know if the STMP server has successfully sent the message. // Returns true or false based on getting mail to SMTP server. Allows the User to specify the number of rows of data to return in a Report Object. It is used in conjunction with setStartRow() to create Report Objects that contain ranges of report row output. This function should be used after defineReport() is called and before createReport() is called. Allows the User to set the attributes associated with given column within a report. The first column is equal to 1. These are the same fields as found in the Report Columns section of the Layout panel. Generally this function does not need to be used. It is much simpler to create and save a Layout and then reference the Layout in defineReport(). The allowable field_names are column_title, column_align, column_action, format, decimal_places, display width and evaluate. Please view the allowable choices for these fields in the Report Columns section of the Layout panel. This function initializes the Input Controls to be used in a page. A single control can be specified by providing a string argument. If more than one control is to be used in a page, an array of string arguments should be provided. This function allows for the values of query variables that are present in the input control query text to be set with a value. Note: This must be set prior to calling the setControl() function. The control_name references a control that was defined in setControl(). Here is an example, assuming that the query text in the following Input Control named "customer number" has a query that contains the text of "select acnt_num from customer where region='[region code]' ". If need be, an entire query can be dynamically set if the query text in the Input Control is nothing more, for example, than [my query text]. This function allows for certain input control characteristics to be overriden and set at the time of use. The field_name can be one of the following. Different fields can be set by issuing this function more than once. default_val This allows for the default value of a field to be set. If the control is a checkbox set or multiple select list, an array of values can be used to set multiple values. error_msg The error message to display when a regular expression check fails. list_text This allows for the replacement of query variables within an Input Control's list text as the data source. max_size the character width of a text input field or text area, or the number of columns of checkboxes or radio buttons when a grid arrangement is specified. reg_exp A regular expression string to perform data validation. select_limit The number of characters that can be entered into a text field or textarea, or the number of selections that can be chosen from a checkbox set or multiple select list. text_rows The number of rows to display in a textarea or the height of a select list. Allows the User to set the attributes associated to the overall page appearance of a report. These are the same fields as found in all the sections of the Layout panel, except for the setColumnAttribute() which corresponds to the Report Columns section of the Layout. Generally this function does not need to be used. It is much simpler to create and save a Layout and then reference the Layout in defineReport(). The allowable field_names for this function can be found by looking at the Table info (from the Query panel) for the table qlr_layout_master. Allows the User to specify that PDF output should be sent to a file or to return a data stream. This function should be used before getPDFfile() is called. When a file is created, it will be saved in the QLR Manager /reports directory unless setPDFfiledir() is used to specify a different location. Please note that when saving to a file, the process will cause the user's browser window to go blank, so some sort of HTML should be sent after the creation of the file. Allows the User to specify the directory of where the PDF file will be created. This can be used when creating a file for downloading or when saving the PDF output to a file. The directory is relative to where the executing report object is located. If not specified, the QLR Manager reports directory is used. Allows the User to specify the name of the PDF file that is being created. This can be used when creating a file for downloading or when saving the PDF output to a file. QLR Manager will automatically add the .pdf file extension. Allows the User to specify options to be used in PDF file creation. header Header text that can be applied to PDF pages. Format is left||center||right text. HTML tagging can be used. footer Footer text that can be applied to PDF pages. Format is left||center||right text. HTML tagging can be used. filedir The destination directory when saving data to a file. filename The file name when saving data to a file or displaying a download dialogue. copy Create file without the ability to copy text. Value = no. edit Create file without the ability to edit text. Value = no. print Create file without the ability to print text. Value = no. watermark Watermark text that will be applied diagonally across each page. background This is a Cascading Style Sheet (CSS) entry that can be used to set the PDF page background. Please see Report Tools help for details. Please note that when using optional settings in a Macro, in order to use a comma as an option value, it needs to be "escaped" by entering a double comma in the value text. That is not the case when using this function. Allows the User to set the value of a query variable when present. This is a literal replacement of the variable value when the Report Object is executed. Allows the User to specify the first row number of data to return in a Report Object. It is used in conjunction with setBlockSize() to create Report Objects that contain ranges of report row output. The first report row is 1. Allows the User to specify text that will be displayed as transparent text rendered diagonally across the first page of the generated PDF file. Allows the User to set the record level tag for XML output. The default value is "record". Allows the User to set the root level tag for XML output. The default value is "data". This function will suppress the addition of the [Select all] [Deselect all] [Reverse] controls that appear on the top of checkbox sets and multiple select list input controls. 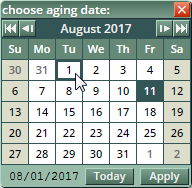 A calendar is provided for use with input controls that require date and time selections. The calendar is automatically included within QLR Manager if an input control is defined using one of the "Calendar" selections available under Control type. These input controls can be created by clicking the link from either the Query or Wizard panels. An example of the calendar can be viewed in the Input Controls topic. This calendar can also be used when input controls are used in conjunction with Report Objects. Since this use requires the calendar be available in the web page using the getControl() and setControl() functions, there are some additional steps required for the calendar to be accessible and function correctly. Note: All the path references below must be adjusted to reference the calendar files relative to the web page PHP directory. All the files required to support the calendar input control are located in the /qlr_manager/calendar directory. It may be more convenient to copy this directory and its contents to a location under the PHP directory to more easily reference the path. The instructions below assume this path configuration. Be sure to read the comments in the top of calendar.html for available configuration options. #calWin This class is required to define the <iframe> that will hold the calendar. .calTime This defines the size, color and background image for the button used to launch the calendar. 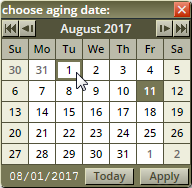 There are 3 calendar configurations to select date only, date plus time, and time only. When used to select a time format only, i.e. 22:59 or 22:59:59, the button image is a clock instead of a calendar. .timein Since the rendering width of text inputs varies greatly among different browsers, these classes are included within the <input type="text" produced with the input control. Using the width rule produces a consistent input width across all browsers. Keep the <iframe> tagging on one line. The instructions above describe the most expedient way of creating a date selection input control. However, this may not provide a control that fits well with the web page design. An alternative is for the Author to create their own control and pass the date value to the report object using the setQueryVar() function. This method provides more flexibility in the design of the control, but it does require that the arguments passed to the openCalendar() function be carefully constructed with the selected value passed to the setQueryVar() function as described in the Overview.